1. Clean out your pond, whether that means a full clean-out or rinsing things off. If you are in an area that has a lot of wind and rain you can expect that everything has landed in your pond. This can also include runoff from your roof. If you can net everything out then you may be ok to just do a partial water drain and call it a day. If not then a full drain and clean it is. Remember that the pond water is great for the lawn or garden. Or save it barrels to use in the yard later. 2. Check your pump to make sure that it’s clean and functioning correctly. Your pump is the heart of your water feature and needs to be in tip-top shape at all times. This is the time to think about if this is the best pump for your needs. Does it pump too much water or too little? Is it energy efficient? Is it noisy? Even in the last two years pond pumps have changed so replacing a pump that uses too much electricity will pay for its self in just a few months. Pumps like AquaSurge Pump or Laguna Maxflo pumps. 3. Fix any leaks in your water feature. Constantly adding tap water to make up for a loss of pond water means the constant addition of nutrients which will eventually promote algae growth. And more importantly wastes water and is harmful to your fish. Remember to always and a water conditioner that removes both chlorine and chloramines. A product like Tetra’s aqua safe or Laguna Water Prep. 7. DO NOT over feed your fish. Fish food that is not eaten will add more nutrients to the pond, helping feed the algae. Start with what they will eat in 5 mins. If they eat it all in 1 minute add a bit more. If after 10 it is still there, net it out and feed less next time. 8. Last but not least, have fun with your water feature! 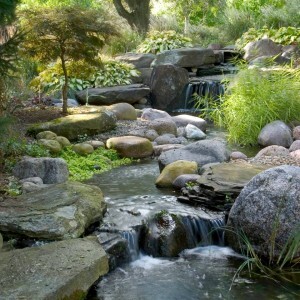 Spruce it up with new landscaping inside and outside of the pond. Spring is the perfect time to add water lilies, bog plants, frogs, fish and turtles. Add a fountain within your feature, add lighting or just change up some of the rockwork! Get creative because after all, your water feature is your masterpiece to enjoy and show off to other. 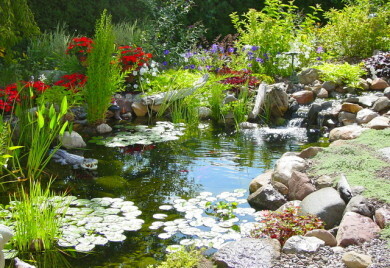 Pond Talk: What to do to get your pond ready for spring? 0 Responses to "What to do to get your pond ready for spring?"